On Sunday, Oct. 8, visit the Heard for a special viewing of two compelling American Indian documentaries; The Mayors of Shiprock and Metal Road, in early celebration of Indigenous Peoples’ Day (October 9, 2017). The screenings will take place in the newly upgraded Steele Auditorium and are free and open to the public. Mayors of Shiprock is the story of a group of young Navajo leaders who take the wheel in community betterment. For over seven years, the Northern Diné Youth Committee has worked to improve their community, be active participants in community civics and provide a positive outlet for youth engagement within Shiprock. 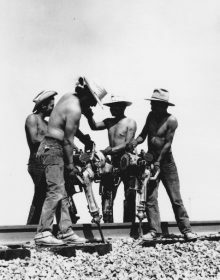 For generations, thousands of Diné people have worked on the railroads maintaining and creating the transcontinental network of America. Metal Road explores the familial and community dynamics a Diné must juggle while leaving their homeland to replace aging railroad tracks across the nation. Indigenous Peoples’ Day is a time to celebrate youth, family, language and the Indigenous voice. The Heard will host a day-long celebration on Monday, October 9, from 10 a.m. to 4 p.m. with music, food, art activities and much more.